One 20 foot diameter by 12 foot sidewater depth clarifier shall be carbon steel construction with immersion duty epoxy coatings. 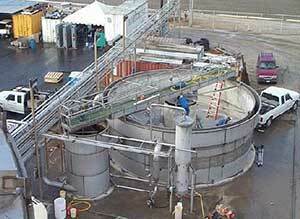 This circular gravity clarifier has 314 sq. ft. settling area and is rated at 876 gpd/ft2 at the design flow of 191 gpm (275,000 GPD). The clarifier is conservatively designed to handle high sludge volumes (for future MLSS) with the 12 feet working depth provided. The total capacity of the 20′ diameter by 12′ water depth unit is 28,185 gallons for a 147 minutes max. theoretical detention time. The polymer flocculant which may be needed to enhance the TSS settling rate and effluent quality can be fed into the externally mounted rapid mix (100 gallon) and slow mix (1000 gallon flocculation) tanks. These tanks are elevated for gravity flow into the clarifier. 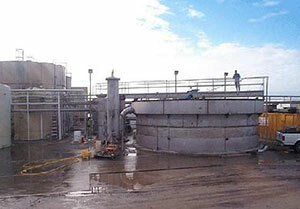 The tanks provide for excellent mixing conditions necessary to optimize the coagulation and/or flocculation processes. The mixing tanks are externally mounted so that the clarifier surface skimming system will be able to remove floating TSS from the entire clarifier surface. Should a typical clarifier center flocculation mixing chamber be employed the floating solids would be trapped inside the center chamber wall. The wastewater flows from the externally mounted flocculation tank into the clarifier center well (stilling chamber) for even flow distribution into the center of the clarifier. The settling solids drop to the sludge blanket and are removed with the rake mechanism. 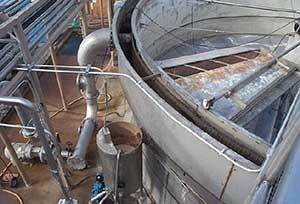 Radial flow of the clarified water is to the circumferentially mounted V notched effluent weir. This circular weir is at the top of clarifier main body wall, at a 20 ft diameter. This provides a very conservative overflow rate of 4379 gpd/ linear foot of weir. 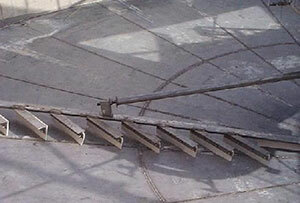 A surface skimming device rotates with the sludge rake drive shaft and collects floating mater into a hopper box. One 18 ft diameter baffle of HDPE shall be installed inside the effluent overflow weir to hold back floating mater for removal with the skimmer. The hopper box discharges via gravity to an outlet pipe with a side wall mounted flange. The air operated sludge pump is to be transfer collected solids to the sludge tank. This pump will be operated automatically based upon a timer setting in the PLC program. The skimmer and wiper shall be stainless and HDPE construction. The collection hopper shall be ¼” carbon steel plate with epoxy coating. One 18 ft diameter baffle of HDPE shall be installed inside the effluent overflow weir to hold back floating mater for removal with the skimmer. forming pathways for the solids to compact and water to escape. One 3″ flanged fitting on the sludge sump will be piped to a 2” cast iron air operated sludge pump. This pump will be operated automatically based upon a timer setting in the PLC program. The sludge plows shall be stainless with HDPE squeegee construction. All fasteners shall be stainless. The main shaft and structural arms shall be carbon steel construction with immersion duty epoxy coatings. 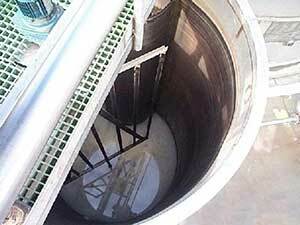 The clarifier has one side manway for ease of access during shutdown maintenance periods. service the drive and observe the clarifier. The bridge walkway is surrounded with 42″ high double-row hand- rails made of 1.5” tubular steel. A stairway to the bridge is included. The overall height to the top of the bridge handrails is 18 feet.